Watermills, structures that rely upon water power to drive mechanical processes, were common features in 19th century Wisconsin settler communities. The earliest of these mills were often sawmills. In addition to processing wood for export, sawmills produced lumber for local use, allowing more ambitious structures to rise alongside the early log cabins. In 1834, Dr. Daniel Bigelow erected Milwaukee’s first water-powered factory when he set up a sawmill beside a small wooden dam on the MILWAUKEE RIVER near present day N. Humboldt Ave. Two years later Bigelow moved to the TOWN OF EAGLE in WAUKESHA COUNTY, where he set up that county’s first gristmill to grind grain into flour. William See, a blacksmith and Methodist preacher, established the Racine area’s first sawmill in 1835, on the Root River at the site of the modern Horlick Dam. OZAUKEE COUNTY’s first sawmill was built in 1838 along Pigeon Creek by settler and preacher Peter Turck. As migrants settled on rivers throughout southeastern Wisconsin in the 1840s, they built a growing number of sawmills and gristmills to power production of flour and lumber. Milwaukee’s industrial capacity received an important boost from the construction in 1842 of a large dam across the MILWAUKEE RIVER near the site of Bigelow’s original sawmill. Part of Byron Kilbourn’s project to build a canal stretching from LAKE MICHIGAN to the Rock River in Jefferson County, this dam diverted water into a mile-long canal tracing the Milwaukee River. While the larger canal project was eventually abandoned, the Milwaukee River dam and canal provided water power to the city’s earliest factories and mills, laying the groundwork for Milwaukee’s rise as a major manufacturing center. The city’s FLOUR MILLING industry began in 1844 when Dr. E. B. Wolcott and John Anderson established a mill. 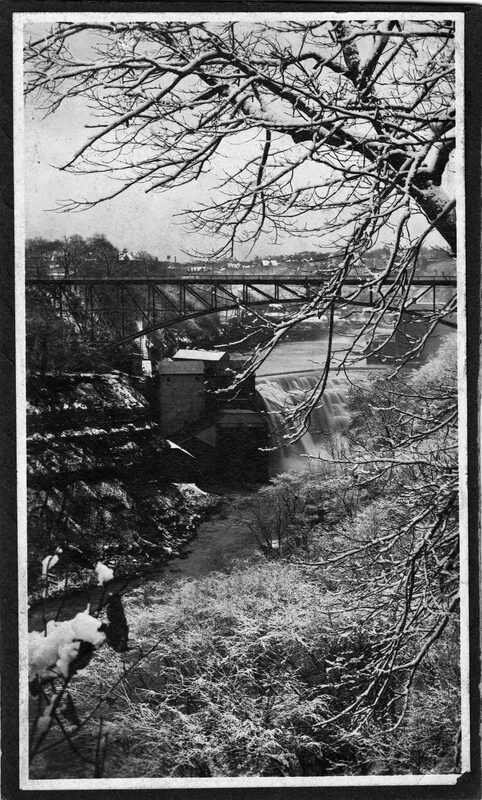 By 1848, the dam and canal provided water power to 25 businesses employing approximately 200 workers, including 5 flour milling companies; an edge tool and scythe maker; a woolen factory; a sawmill; an iron foundry; a tannery; a sash, door, and blind maker; a carriage maker; and a number of wood turning shops. In the 1850s, many manufacturers began using steam engines to power their mills, foundries, and machine shops. Most firms located on Milwaukee’s canal switched from mills to steam power during the 1860s. Legal conflicts over payments for water, the threat of droughts and flooding, and the destruction of the dam by spring freshets in 1866 and 1867 convinced most owners that steam engines were a more reliable source of power. The abandoned canal was used briefly in the 1870s as a free summertime bathing place for women and girls before the city filled it in in the 1880s. Its route is still visible, however, at N. Commerce St. between N. Humboldt Ave. and Pleasant St.
^ Frank Abial Flower, History of Milwaukee, Wisconsin from Prehistoric Times to the Present Date, Embracing a Summary Sketch of the Native Tribes and an Exhaustive Record of Men and Events for the Past Century, Describing in Elaborate Detail the City as It Now Is, Its Commercial, Religious, Educational and Benevolent Institutions, Its Government, Courts, Press and Public Affairs, Its Musical, Dramatic, Literary, Scientific and Social Societies, Its Patriotism during the Late War, Its Development and Future Possibilities and Including Nearly Four Thousand Biographical Sketches of Pioneers and Citizens (Chicago, IL: Western Historical Co., 1881), 135; Milwaukee Writers’ Project, History of Milwaukee County (Milwaukee: Milwaukee Public Library, 1947), 264. ^ Racine County Historical Museum, The Grassroots History of Racine County (Racine, WI: Racine County Historical Museum, Inc., 1978), 60, 132, 159-160, 563. ^ Don Silldorf, “History of Ozaukee County,” Ozaukee County Wisconsin, http://www.co.ozaukee.wi.us/history/Silldorff.html, now available at http://www.co.ozaukee.wi.us/DocumentCenter/View/624, last accessed August 1, 2017; Western Historical Co., Chicago, History of Washington and Ozaukee Counties, Wisconsin, Containing an Account of Its Settlement, Growth, Development and Resources…Biographical Sketches, Portraits of Prominent Men and Early Settlers; The Whole Preceded by a History of Wisconsin…and an Abstract of Its Laws and Constitution (Chicago, IL Western Historical Co., 1881), 545. ^ Racine County Historical Museum, The Grassroots History of Racine County (Racine, WI: Racine County Historical Museum, Inc., 1978), 60, 132, 159-160, 563; Don Silldorf, “History of Ozaukee County,” Ozaukee County Wisconsin; Western Historical Co., History of Washington and Ozaukee Counties, 545; Western Historical Co., The History of Racine and Kenosha Counties, Wisconsin Containing a History of Each County, Its Early Settlement, Growth, Development, Resources…Also History of Wisconsin…Condensed Abstract of Laws of Wisconsin, Miscellaneous, etc. (Chicago, IL: Western Historical Co., 1879), 710. ^ Margaret Walsh, The Manufacturing Frontier: Pioneer Industry in Antebellum Wisconsin 1830-1860 (Madison, WI: State Historical Society of Wisconsin, 1972), 178; Ray Hughes Whitbeck, The Geography and Economic Development of Southeastern Wisconsin: Wisconsin Geological and Natural History Survey Bulletin No. 58, (Madison, WI: Published by the State, 1921), 84. ^ Ray Hughes Whitbeck, The Geography and Economic Development of Southeastern Wisconsin, 84; Bayrd Still, Milwaukee: The History of a City (Madison, WI: The State Historical Society, 1948), 63. ^ Whitbeck, The Geography and Economic Development of Southeastern Wisconsin, 84; Still, Milwaukee, 63. ^ Whitbeck, The Geography and Economic Development of Southeastern Wisconsin, 57. ^ Whitbeck, The Geography and Economic Development of Southeastern Wisconsin, 189; Walsh, The Manufacturing Frontier, 178. ^ Walsh, The Manufacturing Frontier, 178; John G. Gregory, History of Milwaukee, Wisconsin, vol. I (Chicago-Milwaukee: The S.J. Clarke Publishing Company, 1931) 296-298. ^ Gregory, History of Milwaukee, 296-298; Roger D. Simon, “The Expansion of an Industrial City, Milwaukee, 1880-1910 (PhD diss., University of Wisconsin-Madison, 1971), 30. Still, Bayrd. Milwaukee: The History of a City. Madison, WI: The State Historical Society, 1948. Walsh, Margaret. The Manufacturing Frontier: Pioneer Industry in Antebellum Wisconsin 1830-1860. Madison, WI: State Historical Society of Wisconsin, 1972.